It is pretty well known that I am a fan of mug cakes. Most recently, I shared my Pineapple Upside Down Mug Cake, and I have also shared my Chocolate Mug Cake, Banana Mug Cake and Raspberry Mug Cake. I love that you can whip up something pretty amazing in only a few minutes. 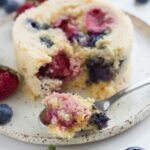 So, if you have a bit of sweet craving, but want to avoid something that is full of processed nasties, then you should totally try a mug cake. Today, I am sharing with you, my Berry Mug Cake. It is a real winner! It is super moist and packed full of flavour. Best of all, it is gluten, dairy and refined sugar free. You can also make it nut free by substituting the nut milk with coconut milk or your preferred milk. I am thinking about the next mug cakes that I should try and create – maybe a caramel one or an orange and poppyseed one. Mmmmm decisions!! Add the coconut flour and baking powder to a mug or ramekin and mix. Next, add the coconut oil and honey and combine with the dry ingredients. Then, add the egg, macadamia milk and vanilla extract, mixing well to combine. Microwave for 2-3 minutes or until cooked through (the mug cake should be soft and springy to touch).